A recent poll showed that one in six people worldwide want to move to London for work. As for so many people London is seen as the city of opportunity. It offers an amazing array interesting jobs, spectacular homes, unforgettable entertainment, countless activities, incredible food and endless things to do; on the surface it appears there are no reasons not to love London life. But for so many living in the city, this could not be further from the truth. London has the highest child poverty rate in the country; it contains 10 of the top 20 constituencies with the highest child poverty rates in the UK. Reasons for living in poverty vary, but rising living costs, job loss or benefit changes are often key factors. Living in poorer conditions can affect childhood, as growing up in poverty increases the chances of young people being cold, hungry and unable to join in the activities in which their peers are involved. For example, ‘60% of families in the bottom income quintile would like, but cannot afford, to take their children on holiday for one week a year’, demonstrating how poverty can diminish the opportunities available to young people. There have been cuts throughout the country in recent years, and these have had a huge impact on families in Westminster. In the 2014/2015 budget Children’s Centres lost £474,000, Youth Services were cut by £125,000 and Play Services faced a loss of £152,000 of funding. In the 2015/16 cabinet report the Westminster council announced £36 million worth of cuts to the budget, with the youth budget being cut to zero. This has diminished the opportunities available to young people in Westminster. At Westminster Befriend a Family we aim to improve the lives of vulnerable and disadvantaged families in Westminster and one way we do this is through offering a wealth of opportunities to isolated and disadvantaged children. In the past we have organised trips to the seaside and the zoo, activities such as picnics and Christmas parties. For many children, these are rare opportunities to join in the leisurely activities that their peers are involved in, and for some, these trips offer a rare chance to leave London. Our community activities, such as swimming and martial art lessons provide opportunities for disadvantaged children. For many of the children this is the only activity they take part in each week. Every child deserves the right to hobbies. 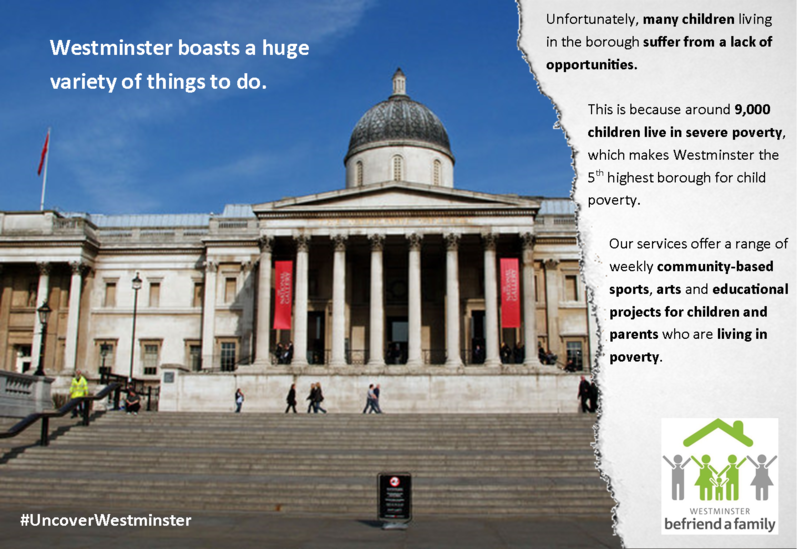 This begins to show the importance of opportunities for disadvantaged families, we need to #UncoverWestminster to raise awareness of these issues and to make sure every person, adult and child alike, has the chance to experience London as a city of opportunities.